One of the most high-profile rookies in the class of 2014 is headed for an extended stay on the sidelines. Given the way his season has gone, though, it might be for the best. The Chicago Bulls announced Friday that rookie forward Doug McDermott will undergo arthroscopic surgery on his right knee on Saturday. A timetable for his recovery will be determined after the completion of the surgery, but standard rehabilitation would seem to suggest four-to-six weeks on the shelf. McDermott had missed the team's four games prior to Friday's home game against the Portland Trail Blazers. The Bulls obtained McDermott, a three-time All-American and 2014 National Player of the Year, in a draft-night trade after the Denver Nuggets made him the 11th-overall pick. While he may have been expected to contribute scoring and shooting to the squad, McDermott has struggled significantly, averaging 3.2 points at 42.3 percent shooting with a PER of 4.0. Most rookies can plan on undergoing an adjustment period, but McDermott probably didn't figure his biggest moment would come when he tried to join a photo he wasn't invited to. From one vantage, McDermott's surgery is yet another incident in a season that has gone about as poorly as possible. From another, though, it could be for the best, a chance to restart the season and work on readying himself for NBA competition apart from the disappointment of minimal playing time and on-court challenges. It's hard to say that this is good news for the one-time (and maybe future?) 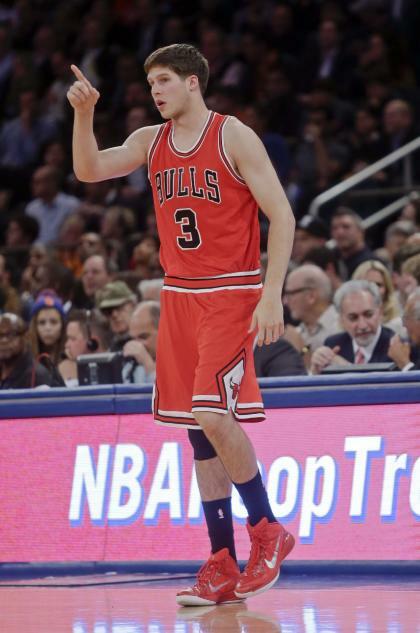 Dougie McBuckets, but it's possible to see a silver lining. McDermott needs to find that positivity wherever he can get it.